One Year = One Million Views! I posted this video just 12 months ago and this clip has been enjoyed by 1,118,000 music enthusiasts from around the world. This cut is righteous and that's a beautiful thing! Whenever anyone asks me what I like to listen to when I get stressed or catch a case of the blues... I often will tell them Stevie Wonder. It just doesn't get a better than Stevie Wonder. Period. I kind of felt like that today. Nothing serious though - just a little frustrated. 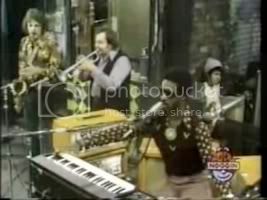 So, I turned on this utterly incredible video of Stevie Wonder and his band playing Sesame Street in '72. ah, back when Sesame Street wasn't lame. Look at the Orange amps! Stevie always was cool- that clavinova sounds fabulous through the Oranges! this is the version i longed for at the comcast center a week or so ago..alas..no luck.